You can listen to 'The woodpile' here. Frightened Rabbit is a band from Scotland. Selkirk to be precise. Singer Scott Henderson has this fat accented form of English that sounds familiar for fans of the likes of Big Country. Not too much of an accent so we foreigners can still follow the lyrics. Musically Frightened Rabbit follows several famous Scottish bands also. Simple Minds, the already mentioned Big Country and other 80s rock/new wave bands, with some influences from the new folk bands of the 10s. 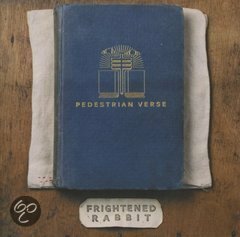 Pedestrian verse is Frightened Rabbit's fourth album since 2006. 2008's 'The midnight organ fight' and 'The winter of mixed drinks' (2010) did not impress me enough to write a review on, so I had some doubts whether I need to get familiar with Pedestrian verse. I'm glad I did though. Not that this will ever be my favorite album. Neither will the 80s bands' I referenced before. That does not mean that it can't be come an album that I appreciate and play every once in a while. Hence Pedestrian verse was played by me quite regularly in the past weeks. Strange name for a band Frightened Rabbit may be, the band does not sound like it on Pedestrian verse. There is some modesty in the music and presentation, where the group's sound is full but not bold. It is here where the band becomes different from the 80s examples who could become larger than life, like the Simple Minds from 'Sparkle in the rain' onwards. It's here that the undertones of the new folk rage come into view. Having written this the loud guitars in the second half of 'Dead now' kick in, blowing the song up beyond proportions. A kick the album needs at that stage. Frightened Rabbit creates a mix of 80s wave, folk and a light version of the Edge sounding guitars. It also takes some concentration to listen to Pedestrian verse. In a song like 'State hospital' (that faintly reminds me of the Editors song with "hospital and smokers" in the title) there is a verse - chorus sequence, but not so obvious that listening to the song makes one sing along easily. This is followed by 'Nitrous gas', a song that really brings out the strength of Frightened Rabbit. Slow, an amorphous atmosphere, well sung, stately. An example that the band is comfortable in several and different moods in songs, although that most are in the mid-tempo range. Don't expect party songs here. Making music or at least in the way it is presented, is a serious business for Frightened Rabbit. With a message or a story. Hutchinson most likely gives a lot of attention to the lyrics he sings. All in all, Pedestrian verse is not my favorite album of 2013 so far, but well worth a review. It is fairly special, made with a care for detail and composition. With far more differences in the approach to songs than I thought starting the album and listening to the first few songs. 'If you were me' is another ballad, carried by an acoustic guitar playing the same pattern over an over, while some atmospheric sound scapes around the guitar and voice. With this beautiful 'ooh' harmony. When 'Snow still melting' comes with the synth propelled beat it comes as a large surprise. Not only because of the beat, also because it's almost singable and has this off pattern chorus. Pedestrian verse is a versatile album that presents the listener with far more interesting views than a first, casual listening reveals. The album drew me into the music slowly, giving away interesting pieces of music each time. Not so much becoming better, but more interesting and intriguing. If you are interested in 80s wave and would like to find out what a modern band does with this sort of music thirty years later, Frightened Rabbit is a good point to start referencing.